Jeffrey Friedl's Blog » The Location May Be Different, But…. The Location May Be Different, But…. We fly 100-gazillion-billion miles to visit America, and the first thing he wants to do is use his allowance to buy a LEGO® Star Wars™ toy he'd been thinking about getting in Japan. It became a Hyena Droid Bomber™ in short order. Star Wars™, and in particular LEGO® Star Wars™, are the center of his universe. I've only mentioned it on the blog a few times (such as here, here, here, and most recently here), but every other post would be about it if I were to give it accurate coverage. So, why is it all on the floor sorted? I would have expected him to have it assembled in the time it took to organize it. How and why did he wait? And while we’re on the subject, why wasn’t it assembled on the ride home? And what only one 2 X 4 X 3 brick? (More commonly know as a 2 X 4, of course that neglects the height) Lego is just not like it used to be, way too many specialty parts. Ironic that Megablocks now makes the most LEGO like lego. * Although since this is a Star Wars piece I suppose LEGO Company had to work around the design. *A few months ago in Wal-mart I saw a massive thing of Megablocks lego in classic shapes, the ones you can actually build stuff with, for $40. Unrelated to the post but how do you get your exif on the bottom of photos? Is it a plug-in or something of your own design? I geotag all my shots and I’m ing to figure out how to display a map link. Thanks for any help! In the age of video games and online friends, I still think Legos hold their own. They were smart to do the brand tie-ins to stay relevant. My son will make the Star Wars version first and then modify them all his own custom jobs. -> To H-E- double hockey sticks with those bootleg mega blocks. (my opinion). 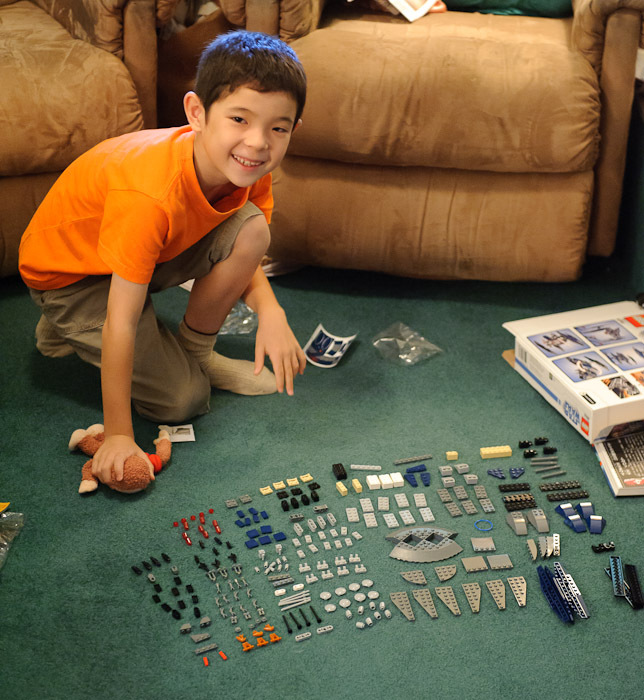 It is interesting that your son catalogs all the parts first. I think I may try that with my kid. Have you and Anthony tried K’Nex? 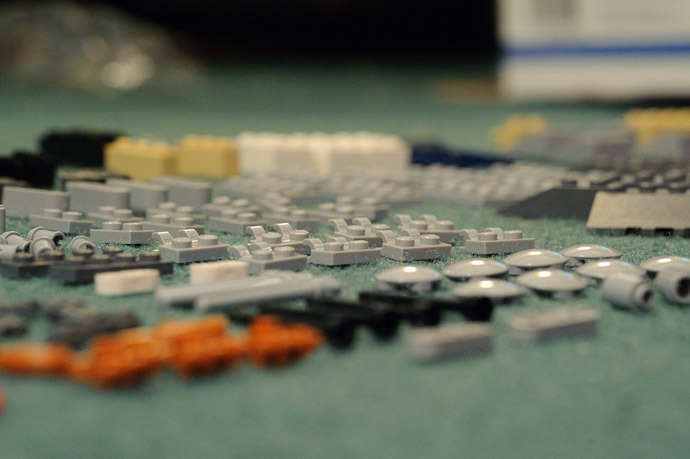 We play with these as a supplement to our Lego addiction. They do fit w/ lego blocks but allow for some really neat child engineering projects that are just the right amount of intentional extra difficulty. Next time you all are in the Mountain View/San Jose Area, I hope you will come by our place so Anthony can enjoy the vanload of Legos our neighbors put out on the street under a “Free” sign. We have been having Lego camp at Grandmother’s all summer!